Overall, whilst the expansion rate was once thought to be running at 1 – 3% in the UK (Taylor, 1986), it seems likely that the rate could actually now be more than this. Indeed anecdotal evidence suggests the expansion rate could be as high as 5 - 6% in some localised areas. The Countryside Survey 2000 report shows that during the 9 year period of the survey, from 1990 to 1998, there was a 26% gain of the bracken cover throughout Great Britain and a 20% loss. This equates to approximately 108,000 hectares of bracken gained and approximately 82,800 hectares lost. The government annual aerial spraying returns show that during this same period 59,734 hectares of bracken land were sprayed. Without this work, the total net gain could have been around 85,000 hectares, probably more as the uncounted areas with their (original) lower infestation levels would also have been consolidating. This represents an annual increase of around 2.5%; worryingly close to the 3% “worse case” scenario indicated in the Taylor paper. Note: the loss of bracken due to aerial spraying control would have been augmented by other types of bracken control e.g. ploughing, cutting, tractor and knapsack spraying etc. wherever terrain and safety issues allowed. However, the latest survey report (Countryside Survey 2007) concludes that there has been a 17% reduction in Bracken Broad Habitat throughout Great Britain from 1998 to 2007. There could be several possible explanations for this, (or more likely, a combination of these). Firstly, the period of the survey coincided with some very cold and wet summers (particularly 2007). Bracken does not thrive in such conditions and far from expanding its territory tends to do the opposite (the 2007 report does acknowledge this at sector 7.8.1). However, it only takes one or two warmer summers for the bracken to make up the lost ground and more. Secondly, there were changes in definitions of what qualifies as ‘dense’ bracken cover, and this makes direct comparisons from different surveys difficult. The Bracken Broad Habitat is defined in the CS2007 study as only areas with 95 to 100% bracken cover, so the reported changes in area often reflect subtle changes in bracken cover rather than wholesale loss of bracken cover. However, taking the 2007 report’s adjusted figure for 1998 Bracken Broad Habitat cover of 315,000 hectares, and comparing it to their figure for 2007 of 260,000 hectares, there is a loss shown of 55,000 hectares over that period. Which brings us to the third explanation. The UK aerial application operators, having invested in both ground support and aerial spraying equipment, are now extremely efficient. Although small in numbers the industry was able to spray a total of 52,822 hectares (as per Ministry Aerial Spraying Returns) over that same period. This fact would clearly have played a major part in the reduction referred to above. From our own viewpoint, it was interesting to note that the report stated (7.8.1) that the “decrease was most marked in Wales where the area of bracken cover more than halved”. Wales and the border area of Shropshire comprise our main areas of operations (but with occasional forays into the West Country and East Anglia). 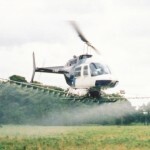 It is a fact that M D Air Services sprayed slightly over 10 000 hectares in this area during the period covered by the report, and it is likely that farmers and contractors may also have treated a thousand or so more by various means in that same time. This combination of bracken control methodologies may well have played a major part in bringing about the reported decrease. Nevertheless, having always maintained a close contact with many of our clients, we have to say that none have as yet reported any natural decrease in their bracken cover. Indeed anecdotal evidence suggests that in many cases the opposite has occurred, and that they are clearly totally reliant upon current bracken control methodologies to safeguard their strategically and commercially valuable upland pasture from becoming inundated with this pest. It should be noted here that even land with less than the 95% CS2007 datum will of course have a very negative effect upon the viability of those farms affected. Indeed, the presence of just a 40% bracken cover in grazing areas will invoke most of the range of problems associated with this debilitating and invasive plant. However, it is somewhat heartening to note the CS2007 report’s statement (section 7:5:1 Changes in the Condition of Bracken Broad Habitat) “There was increase in species richness in Wales between 1998 and 2007”. Such is quite typical of what normally happens after we have sprayed the bracken. Hopefully, our endeavours may be seen by the regulating bodies to have played a significant part in this valuable gain to the environment. Indeed this may well have influenced the view of government when the matters of the derogation (to allow continuance of aerial spraying) and Authorisation for continued use of asulam (Asulox) were being considered. More details on derogation can be found on the EU Involvement page here. 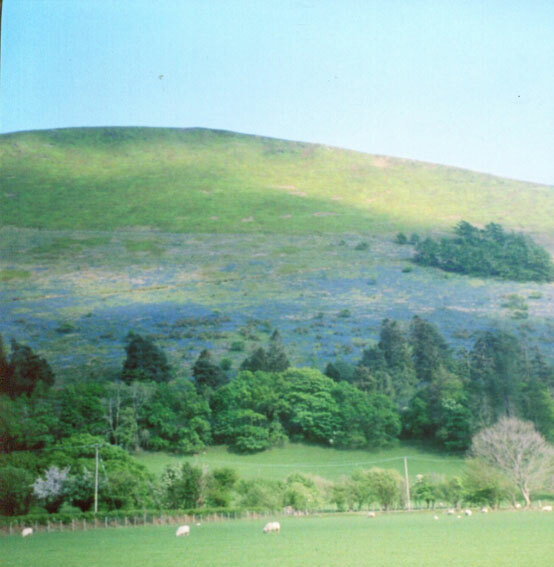 This attractive display of bluebells was photographed in June of the year after our most recent spraying of this particular bracken area (2007). The photo also shows the very thorough bracken clearance that is so typical of M D Air Services’ work. Note: we had sprayed this land 17 years earlier but it was only 7 years or so ago that the bracken began to return. Interestingly, the bluebells are now more prolific than they were 17 years ago!! It is also worth noting that there have been significant reductions in bracken cover recorded in earlier times and although the Hunting Report of 1986 had stated that bracken expansion in the UK was static, the census survey of national parks in England and Wales (Countryside Commission,1991) showed a marked decrease in cover between the late 1970s and mid 1980s. Further, there was also a significant reduction in cover between 1984 and 1990 (Pakeman et al 1996). Interestingly these two periods coincided with what had been the "heyday" of the UK aerial application industry when there were some 40 - 50 UK aerial operators in business (now there are only 4). Most of these would have sent at least one aircraft off to spray bracken each year, and anecdotal evidence indicates that many would spray at least 500 hectares (in spite of what the Ministry aerial spraying returns of the day would show). Indeed DEFRA in their ‘Public Service Document (document posted 06/01/03) referring to the change in bracken cover that occurred at that time wrote “a change that was attributed, at least in part, to the success of control measures during the period”. It is quite clear that the most productive control measure was that of the aerial spraying of Asulox; no other medium would have been able to achieve anything but a small fraction of the work output that all those aircraft managed at that time. Currently, the reality is that the bracken problem is just not being kept fully under control. The limiting factor is that of funding: if the farmers and owners of land afflicted by bracken could be given more financial aid, so much more could be done. Bringing back the old 50% “no strings attached” grant aid would be a step in the right direction; this would be good (directly and/or indirectly) for local rural economies , and for the environment in general (and of course would maintain the sustainability of the Aerial Application Industry). 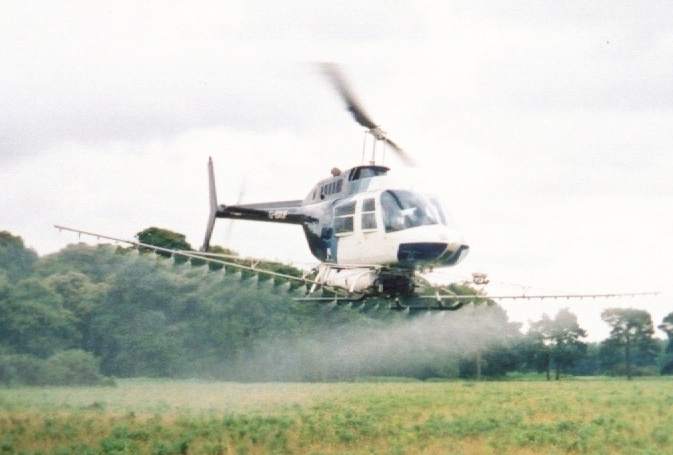 As a result of the operational improvements previously mentioned, the existing small UK fleet of spray helicopters could more or less double the current annual acreage of bracken being sprayed which really would allow us to get well ahead of the bracken problem in the UK; all that is needed is a positive change in government funding policy! As land use requirements start to enter the more critical situations that lie in wait (in the not too distant future), current upland funding policies will surely have to change. Bearing in mind that it can take anywhere between 4 and 10 years to convert heavily infested bracken land back to useful mountain pasture, it is to be hoped that people in the Upland Policy Unit of DEFRA are already looking closely at this issue!